Which Provides Better Protection for Homeowners in Westborough, MA… LeafGuard or Gutter Shell? Westborough, MA homeowners looking for gutter protection ask this question ALL THE TIME. And it’s no wonder—both are extremely popular types of gutter protection in New England. But one is better than the other. In this head-to-head comparison, we compare their features and show you the definitive winner in the “Gutter Shell vs. LeafGuard” battle for gutter-protection supremacy. LeafGuard: For homeowners in Westborough, MA, LeafGuard is one of the most expensive gutter covers on the market. This is because LeafGuard requires you to replace your gutters and downspouts, even if they are in good condition. Gutter Shell: Gutter Shell is a cover-only gutter protector that can be securely installed on your existing gutters. If your gutters are in good shape, going with cover-only gutter protection saves you a boatload of money. LeafGuard: LeafGuard uses surface tension to pull water around its curved nose and into your gutters. It provides solid protection against debris, and it does a good job at handling rain during the regular storm. That said, LeafGuard’s single-drop system (meaning that it has only one space for water to enter the gutters) does not perform well in heavy rain—excess water tends to “fly over” LeafGuard, missing your gutters and falling next to your home’s foundation. Gutter Shell: Like LeafGuard, Gutter Shell relies on surface tension to let water in and keep debris out. The difference is that Gutter Shell is built with a patented double-drip design to withstand heavier downpours—if the first opening doesn’t catch the rainwater, the second opening will. LeafGuard: A strong, sturdy design means LeafGuard lasts Westborough, MA homeowners a long time. But beware—if just one piece of LeafGuard’s gutter system breaks beyond repair, you have to install a completely new one... downspouts, gutters, protection, and all. Gutter Shell: Gutter Shell requires little maintenance beyond the occasional spray down with a hose. 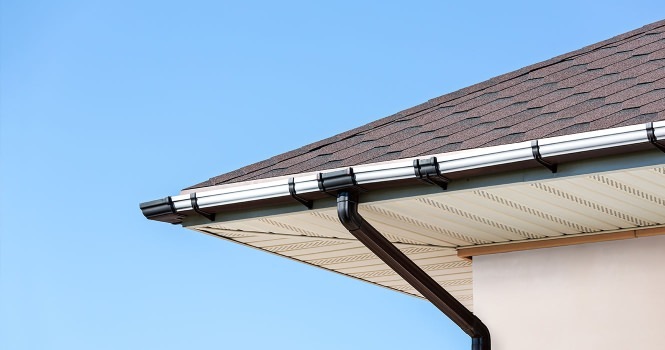 In addition, Gutter Shell is guaranteed to perform and remain clog-free for as long as you own your home—a feature most gutter covers don’t provide. Honestly, for homeowners in Westborough, MA, LeafGuard isn’t a bad choice for gutter protection (there are much worse options). But its price, inability to withstand heavy rain, and the fact that it’s one big piece are all negatives. Gutter Shell has none of those issues. It’s affordable, is a cover-only system, and can stand up to anything Mother Nature throws at it. That’s why it’s the winner of Round 1 of our gutter cover comparisons. If you’d like to know more about why Gutter Shell is the absolute best choice for gutter covers in Westborough, MA, click here to find out more. And if you’d like to see Round 2 of our gutter cover comparisons (in which we compare Gutter Shell to the ultra-popular LeafFilter), click here.